I have begun the new year with a new concern. Following the departure of the Sweelinck Ensemble’s Martin Knizia in July last year, there has been some uncertainty regarding the Bach Vespers series at St Anne’s Lutheran Church. 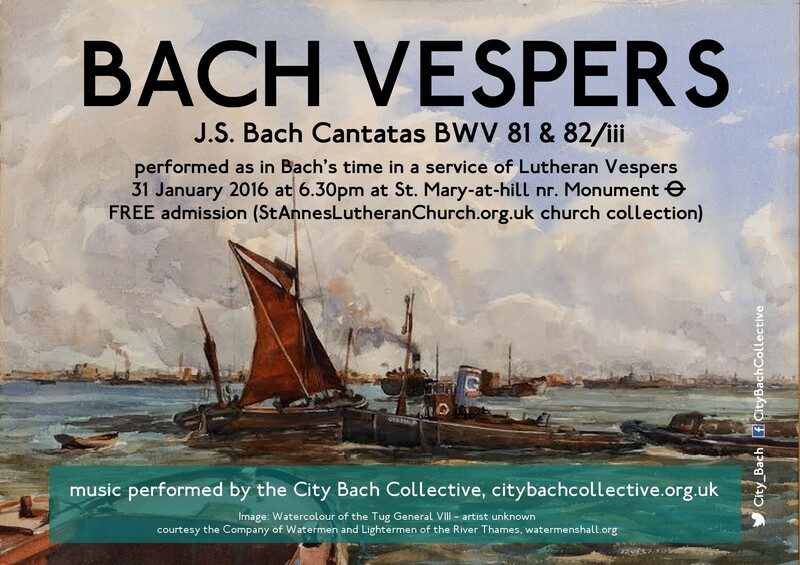 I and my colleagues who are now familiar with the event has returned at the invitation of the church to perform Bach Vespers once again under the title of our reformed ensemble, the City Bach Collective. With the great legacy of the work of both Peter Lea-Cox and Martin Knizia behind us and the mutual experience of the majority of the dozen-strong core ensemble, continuing the work of the group seemed the right thing to do. The City Bach Collective will perform without a dedicated director, with the leader, Hazel Brooks directing from the principal violin chair. The first service of 2016 was cantata BWV 81 and the middle movement of cantata BWV 82a, Ich habe genug, for soprano and recorder. In addition we performed music by Scheidt and Schütz. It was a successful evening and we are encouraged that the Collective has the talent, tenacity and ambition to go on to do more Bach in the City of London throughout 2016 and beyond. This entry was posted in Concert on February 4, 2016 by admin.